While this post has nothing to do with the stated purpose of this blog ( I posted it on my other blog) I wanted to place it here, because I hope it’s message will resonate with some of my readers who do not subscribe to my other blog. For many years I felt I possessed an insight into this verse that a lot of people could not appreciate. Whenever I read this verse, invariably an image would come to mind of experiences I had in Vietnam. I remember being on guard in Vietnam, staring out into the darkness, praying that I would see nothing throughout a long and fearful night. Most of the time, the night would pass uneventfully, although it was not always to be so. But it’s that image of staring out into a darkness so black that it seems to envelop you that I most remember. Can you imagine the relief when daylight finally arrives and most of the danger is over? And that’s how it must have felt to watchmen on the city walls in the ancient world; fear turning to relief with the promise of one more day. As I try to deal with a diagnosis of terminal lung cancer I feel some of that same anxiety. I see before me a darkness that threatens to swallow me up with no promise of daylight at the end. You see, I understand that life is too uncertain and our fears too real for them to be explained away simply by quoting an inspirational verse. You can quote this verse (and hundreds of others) to me, but the darkness is still there and the struggles ongoing. So, what should we do with verses like this? First of all, be careful before you post an inspirational verse on social media. Can you understand that I now have two perspectives on this verse that many of you cannot identify with (Vietnam and cancer)? Posting a verse such as this provides little encouragement to me, unless it is put into a context that recognizes the full reality of my situation. I would even suggest that until you have experienced real hardship in life, perhaps you may not be the best one to provide encouragement. Better to leave that to those who have some battle scars and have experienced struggle firsthand. So how can this and similar verses encourage us? Certainly not by some “health and wealth” platitude that everything is going to work out fine. From a material perspective, it may not. Yes, I can and do look forward in faith to a time when the darkness is over and an eternal morning dawns. I believe that, but I still have to deal everyday with pain and struggles that are so real I am reluctant to describe them. I have to watch my wife step in and do so many things that should be my responsibility. And although she does so magnificently and without a word of complaining, it is hard for me to accept. So, just in case you missed it, here is the lesson with which I would leave you. Please recognize that life is real and struggle is part of it. For many of us the darkness is always there, ready to engulf us. Simply posting an inspirational verse or quotation by itself is not enough. Do something to acknowledge that you recognize the reality behind it. The last thing someone struggling with a serious problem needs is for someone to post something that just adds to their guilt, because they do not have a blind faith that takes away all of the fear. And as much as I long for the morning, today the darkness is still there. So, leave me with encouragement as I struggle with that darkness, rather than guilt because I am still struggling. Originally I did not intend to comment about my ongoing battle with lung cancer, but I feel the need to share a short summary of what I am doing and how I am responding. As I anticipated, it has been almost impossible to maintain the physical and mental discipline necessary to post further entries. I still hope to be able to do that sometimes, but that will depend on my response to treatment. In the meantime, for those who are interested, I am responding to chemo as well as could be expected. After three rounds of chemo, my oncologist ordered a CT scan which shows that the chemo has been somewhat effective at reducing the cancer. She ordered three more rounds of chemo. At that time, they will do another CT scan and decide what if any treatment would be appropriate going forward. I am dealing with chemo induced anemia, but there is a shot I take that helps raise the red blood count. Overall, I believe I am responding to treatment as well as could be expected. Generally, I am upbeat, and I am certainly not sitting at home waiting to die. While that may come at some point, I would like to use my situation to encourage others who are facing trials that may appear insurmountable. I have had much time to think about how I would like to be remembered. I hope that this blog has provided (and may still continue to provide) factual and interesting information about the history of the Bible. More than that, I would like to use my condition to touch other peoples’ lives. If my experience can provide strength for someone who feels hopelessly entangled in depression, guilt, or despair that would be the greatest blessing I could receive. And if something I wrote caused another person to pick themselves up and try again, I would be thrilled. If you have not checked the page in this blog that has a link to my other blog, Faith and Inspiration, you might wish to do that. I am using that blog now to post updates as well as inspirational posts. Obviously, the focus of my life must now change, but I hope that in whatever format it may be, I may continue to influence others for good. I see all the negativity on social media, and it saddens me beyond measure. It’s not how I wish to be remembered. So, I’m still here, feeling fairly well, even as I continue to deal with effects of chemo. I have a future before me, whether it is months or a couple of years doesn’t really matter. What matters is how I can help other people. That is what I want to do now, and that is how I would like to be remembered. This post is to let my readers know that the nature of this blog may change in ways that cannot be predicted at this time. On April 15, 2014, I was diagnosed with stage 4 lung cancer. Further tests are being run to determine the best course of treatment, but the oncologist made it clear that the goal of treatment is not to cure the disease, but to prolong my life. I have never been a smoker, and we have no history of lung cancer (actually of much cancer at all) in our family. The oncologist agrees that if there is a single cause, it is most likely due to exposure to Agent Orange in Vietnam. In the next day or two I will be contacting the Veterans Administration to apply for service related disability. Obviously, this development will impact what happens to this blog going forward. Right now I intend to continue making posts, although they may be shorter and more infrequent. How that changes in the future is in God’s hands. Since this is a Christian blog, I feel open about requesting prayers from believers who feel inclined to do so. I am most concerned about how this will impact my family, especially with a mentally disabled son living with us. This is all I intend to say about this on my blog unless conditions change to the point that further information needs to be given. The current issue of Biblical Archaeology Review contains an article, which discusses how many characters mentioned in the Bible have been confirmed. The article lists 50 people, although the author says that list is conservative. This includes not just people we normally think of as “Bible characters,” but also ancient kings and Pharaohs which are referred to in the Bible. Actually the list is limited to people mentioned in the Old Testament; the article makes no reference to New Testament characters. Attempting to compile a complete list would be difficult, because that would involve dealing with some characters for whom the archaeological evidence is uncertain, and about which there is disagreement. Even so, I would love to see a more complete list. 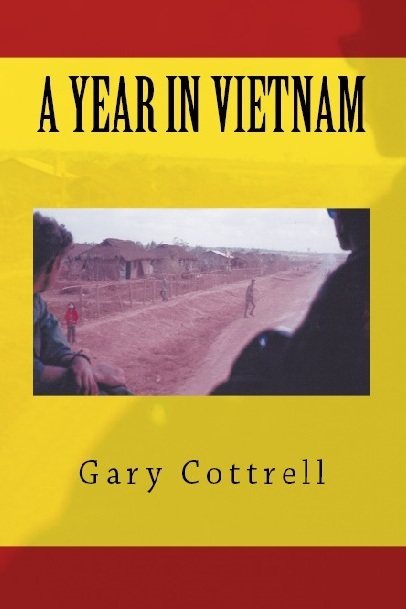 1998 I wrote my memoirs, describing my experiences with the U. S. Army in Vietnam during 1969-1970. The title of the book is In the Shadow of Dragon Mountain. Because of the personal nature of the book, I did not publish it. Instead, I printed a limited number of copies for family and friends. I have rewritten this book and added a number of photographs which will display in color or black and white, depending on the device you use. A pdf copy is available as a free download. The book may also be purchased from Amazon in a Kindle format for $.99. Finally, a paperback version (pictures are in black and white) is available which Amazon is selling for $8.50. The link below will take you to the “My Books” page of my blog where you can get more information. It also contains links to each version of the book. Jesus was born on December 25. Actually, nowhere in the Bible are we given the date of Jesus’ birth, and shepherds would not likely have been in the fields in late December. The truth is we can’t even be certain of the year. The manger scene as we normally picture it is almost certainly not accurate. There were no “inns” as we know the term today. Actually the word commonly translated as “inn” is only used two other times in the New Testament in Mark 14:14 and its parallel passage, Luke 22:11. There it refers to the room where Jesus and His disciples had the Last Supper. Jesus may even have been born in a house that took Joseph and Mary in. In the ancient world animals were often kept within the house, sometimes on the first floor while the family slept on a second floor. So, if there was no room on the second floor, Joseph and Mary may have been placed with the animals on the first floor. The point is that the cute little manger scene probably does not reflect what really happened. The wise men were not there. Luke says nothing about wise men; that account is found in Matthew. The Magi as the Greek refers to them (we get the word “magic” from the name) were probably astrologers. That’s why the star meant something to them. And the wise men find Joseph, Mary, and Jesus living in a house in Bethlehem. Matthew says nothing about them coming from Nazareth. The visit of the wise men may have been when Jesus was two years old. Matthew has Herod killing all male children two years and under. In the tiny village of Bethlehem Herod would have killed at most a dozen children, not enough to merit a place in history. Herod was known for doing much worse. We also tend to picture Christmas in one of two ways. We may remember Christmas from our childhood—for some of us quite long ago. The other picture has been implanted in our minds by Charles Dickens. Because of his famous story, A Christmas Carol, our minds almost unconsciously bring up images of Victorian England. Nothing is wrong with either of these images; I tend to use them as well. At the same time, we should recognize that Christmas is not exclusively American or European. The message of Christmas is for all people in all ages. Below is a page from the Codex Vaticanus, showing what we have come to label as Luke 2:4—29. This early manuscript of course has neither chapters nor verses. It dates to approximately AD 325. Actually, the earliest manuscript that contains this story is p45 and it dates from about AD 225, a hundred years earlier than the Vaticanus. I would suggest that as we look at the page from the Vaticanus, we pause to remember two things. First of all, the Christmas story is not a Victorian invention. As much as we may have buried its message in commercialism, it is still a part of the Christian message that goes back to the time Luke was originally written. Also, Christmas is not an invention of Western culture. While it is meaningful to us, it is just as much for all people in all times. The story of Christmas is after all a message of hope and redemption, and all of us need that in some way. While the King James Version may not be the best translation of the Greek text, its message has resonated for centuries, and it still speaks to us today. I leave you with it, just as it was spelled in the 1611 version. Glory to God in the highest, and on earth peace, good wil towards men. And don’t forget to listen to this version of the Christmas story. 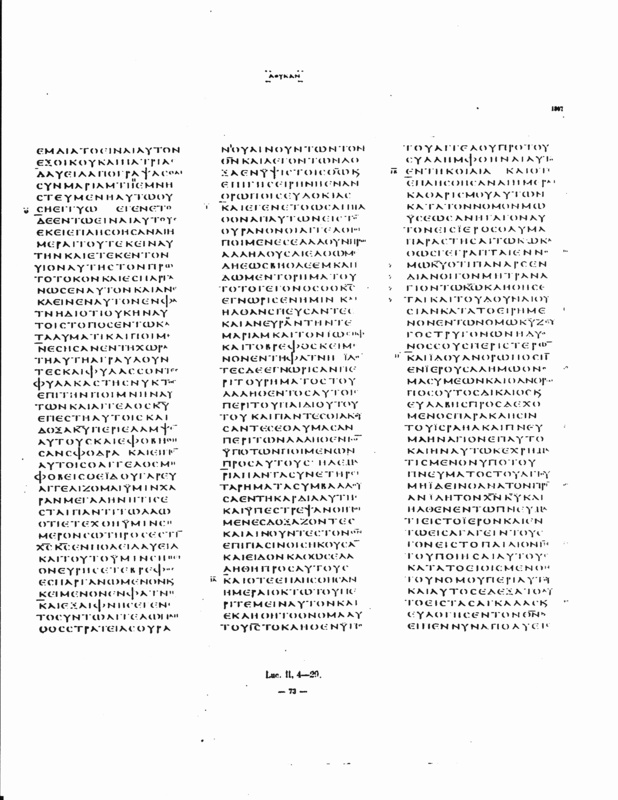 A large number of the posts in this blog have dealt with textual variations in one form or another, especially in the text of the New Testament. I have concentrated so much on this topic, because opponents of the Bible frequently charge that the variations among the manuscripts demonstrates that the text of the Bible has become so hopelessly corrupted that we cannot know whether it reflects the documents as originally written. I have attempted to face the issues as honestly as possible. Most recently I concluded a series of posts, concentrating on the most serious textual problems we find in the New Testament. I thought about doing one or two more, but I feel the point has been made. Some of my readers questioned my interpretation of the evidence for some of these passages, and with good reason. While a huge proportion of the variations can be determined with virtual certainty, there are passages for which the evidence is more subjective and which do make a real difference in how we read certain books. That is precisely why I chose these passages to examine. I wanted to bring out into the open the most serious textual problems we find. I have attempted to demonstrate that the most significant textual problems we find have more to do with favorite stories than with real doctrinal or theological issues. Let me mention three that reflect what I have been trying to say. The story of the woman taken in adultery in John 8 has no doctrinal or theological significance. Removing this story from the text may take away a favorite story (and it is one of my favorites), but it does no damage to anything taught in the New Testament. The baptismal confession in Acts 8 describes a doctrinal practice within the heritage in which I was raised, but once again, only reflects a simple ritual that very few people would see as significant in any real sense. Finally, the heavenly witnesses found in 1 John 5 provides a specific reference to what came to be known as the Trinity. At the same time, there are a number of other passages that teach essentially the same thing about which there is no question textually. So, once again, no theological teaching is in question. And these passages are truly representative of the most serious kinds of textual problems we find in the New Testament. Those who suggest that the text of the Bible has become so corrupted that we cannot have any confidence in what it teaches have the burden of proof to back up such assertions. From my study there is simply no substantial evidence to support such charges. On the contrary, with over 5,800 Greek manuscripts dating back to the second and third centuries, we have a wealth of evidence that should cause us to feel confident that when we read the Bible, we are reading what the authors originally wrote. I remain convinced that is where the evidence should lead us.